"I really did enjoy it and see it in the tradition of naturalist writing that helps keep people both informed and passionate about places and wildlife." Jan Miller 2005. Matador ISBN 1-90523-735-9. 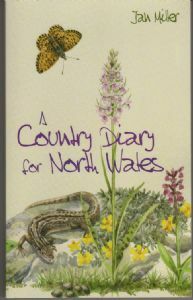 “This delightful and charismatic little book is a compilation of Butterfly Conservation North Wales Branch volunteer Jan Miller’s column in the Denbighshire Free Press, but this is more than a parochial book. Choice quotations are scattered through the text, from DH Lawrence to John Cooper Clarke, while the authors own observations range from Dutch windmills to global warming. There’s some lovely humour, too. Of hedge-laying she notes that sharp tools and unswerving confidence are the basic requirements for success, adding that the same could probably be said of most things in life. And the tale of her phone call to the Countryside Council for Wales to report a dead polecat had me laughing out loud best to let you read that one yourself. Newts and woodlice, bumblebees and badgers all amble through this entertaining and articulate book, but its the butterflies and moths that are the heroes, many illustrated by the late Alan Wagstaff, to whom the book is dedicated. “North Wales is a large patch, and Jan Miller stretches her canvas wide by introducing current affairs, literature, local history, folklore and anything else that takes her fancy into her diary. The author’s warm and curious personality comes to the fore, as does her enthusiasm for the delights of her home territory. With its chatty style, this is an easy read. For me what marks it out is the author’s insatiable appetite for involving others in the pleasures of contact with, and working for wildlife. REDUCED NOW FROM £7.95 TO £5.00! !